Summit School District canceled classes at all of its schools this Friday in anticipation of planned teacher protests at the state Capitol calling for increased K-12 education funding and pension protections. Thousands of teachers from across the state are expected to join in the protests, including at least eight of the state’s ten largest districts. Colorado teachers have been rallying for more education funding and retirement benefit protections in recent weeks, but Friday’s demonstration is set to be the largest yet. On Monday, the district said it expects at least 130 of its teachers to partake in the demonstration. In a letter to parents, the district said it didn’t have enough substitutes to cover the absences or offer alternative activities at the school. “We realize this change in school operations is a challenge for our families, and we apologize for the inconvenience,” read the letter, signed by superintendent Kerry Buhler. 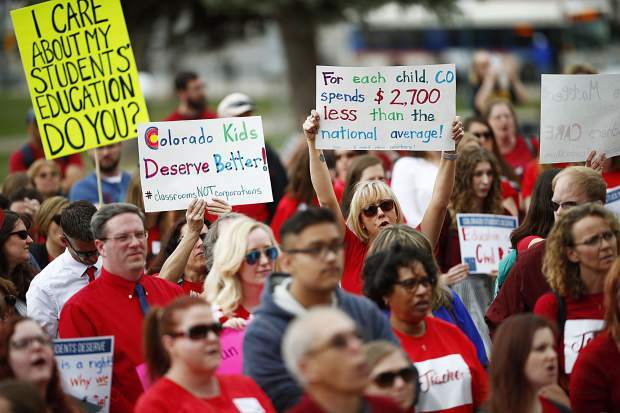 Colorado’s school funding and teacher pay rank among the lowest in the country, and fiscal constraints like the Taxpayer Bill of Rights have contributed to a steady decline in per-pupil funding. In 1982, Colorado spent an inflation-adjusted $232 more per student than the national average compared to $2,162 less per pupil in 2015, according to education groups. At least one study has ranked Colorado dead last in the country for competitiveness in teacher pay. When inflation is considered, the state’s teachers have lost 20 percent of their income over the past two decades, according to an SCEA fact sheet. “I’ve seen a lot of different statistics, but no matter which ones you look at, it’s just bad,” said Kim Phipps, a math teacher at Summit High School and SCEA leadership team member. Thanks in part to voter-approved local taxes, Summit’s education funding is relatively strong, but there are deep disparities in districts across the state. Phipps said local teachers are protesting in solidarity with under-funded jurisdictions. Phipps said the district was supportive of the teachers in meetings about the possible action over the past two weeks. In a phone interview Monday, Buhler said the district simply asked teachers to follow protocol and request time off. The timing of the protests in Colorado coincides with a national wave of teacher activism in Arizona, Kentucky, Oklahoma and West Virginia, where educators have staged walkouts and marches to demand more education funding. In Colorado, the movement has come to a head largely over the State Legislature’s efforts to stabilize Colorado’s pension system, which has between $32 and $50 billion in unfunded obligations. Teachers and other public employees fear lawmakers will slash benefits to narrow the funding gap. An estimated 400 teachers rallied at the Capitol on April 16 to demand higher pay and protest efforts in the Republican-led Senate to reduce benefits and increase employee contributions to the pension fund. The Democratic majority in the House of Representatives nixed a Republican proposal to increase employee contributions in an early version of its own reform bill, replacing it with a $225 million payment from the state. That plan is sure to be opposed by conservatives who argue that belt-tightening is necessary, but it drew praise from teachers.